Top 10 Most Colorful Landscape Garden Plants for the South. 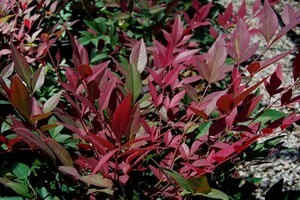 The Obsession Nandina is a new breakthrough variety that produces red foliage year around! Obsession is a sport of Nandina domestica ‘Gulf Stream’ but unlike it's Mom, it has bright red colored young foliage produced while the plant is actively growing during the warm season. The cultivar name 'SEIKA' means "sacred fire" in Japanese and was given as the name because of the color of the new growth. Mature foliage is deep green in color. An upright, compact, dense grower that will tolerate sun or shade but I've found it produces better color with more sun. Like 'Gulf Stream', Obsession is a dwarf Nandina and remains small at 24-30" tall with a 20-24" spread. Useful in the landscape planted as a specimen or in small clusters or large mass plantings. Can also be useful to accentuate entryways, and I've used it to hide air conditioning units and utility boxes or in foundation plantings. Hardy in Zones 7 to 10. 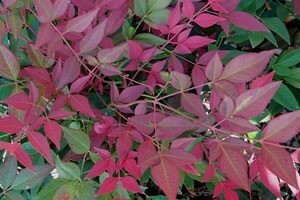 Find out more about Obsession Nandina and buy it here. Looking for a Loropetalum that holds it's deep purple foliage all year? If you like Loropetalum, but don’t like the large growth habit or the seasonal green foliage you get with other varieties, this cultivar is for you. The leaves of Purple Diamond Loropetalum are purple year round on both the front and back side of the leaf. Mature height is 4 to 5 feet height with an equal spread. As with most other Loropetalum, Purple Diamond prefers well-drained soils and full sun to part shade. It is a very low maintenance plant that produces an abundance of attractive, hot pink spider like flowers in the spring. Because it flowers on new growth, any time you give Purple Diamond a shearing or pruning during the active growing season it will produce a light flush of flowers. Purple Diamond is an excellent selection for foundation plantings and is also useful as a specimen, as a formal or informal hedge that responds well to shearing, to accentuate an entryway, or in shrub borders. I have it growing in both sun and shade. In sun, the foliage is deeper in color and the plant more dense. Find out more about Purple Diamond Loropetalum and buy it here. For sure, Kaleidoscope Abelia was properly named. True to its name, this new Abelia produces a myriad of colors throughout the year. During the warmer months of spring and summer the leaves are variegated vivid yellow with dark green center splotches, the shrub appearing as solid yellow from a distance. As the temperatures start to cool in fall the foliage of Kaleidoscope starts to become tinged with orange. As winter comes the foliage turns to a deeper orange-red with deep burgundy to maroon centers and holds this color until new golden growth begins to emerge in spring. Though somewhat inconspicuous due to the outstanding foliage, an abundance of pink buds open to small white bell-shape flowers during summer and into fall. Kaleidoscope is outstanding when planted in sunny shrub borders and foundation plantings. The habit is dense and mounded growing to a height of 2 to 3 feet with a 3 to 4 foot spread. It prefers well-drained soil and is exceptionally drought and heat tolerant once established. A truly outstanding plant that has very few if any problems. Responds well to shearing. Hardy in Zones 6 to 9. Find out more about Kaleidoscope Abelia and buy it here. Flirt™ Dwarf Nandina is a true dwarf nandina that produces wine-red to red foliage year round!...unlike Harbour Dwarf, which turns red in winter, but has green foliage the rest of the year. Too, with Flirt, the foliage goes almost completely red in winter. Flirt Nandina is a very drought, cold, heat and humidity tolerant plant that can be planted in sunny or shady sites, though I've found that the red color will be more intense with more sun. White flower clusters rise above tight, dense, mounding foliage that spreads slowly through underground rhizomes with age. It has yet to produce berries in my landscape, but that may be due to the exceptionally long and hot summers we've had since I planted this new variety in my garden? In any event, the spring flowers contrast beautifully with the red foliage and it really wouldn't matter if this plant bloomed or not as the foliage is quite remarkable on its own. As a true dwarf that grows 18 to 24 inches in height with an equal spread, Flirt is excellent for use in small clusters or mass plantings as a groundcover. It can also be used as a low informal hedge or border along walkways or paths. This is one outstandingly attractive, low-maintenance, and highly useful plant! Hardy in Zones 7 to 10. 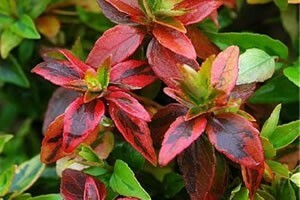 Find out more about Flirt Dwarf Nandina and buy it here. 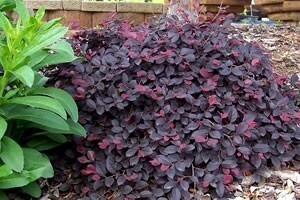 Don't you wish there was a true dwarf Loroptalum with purple foliage year round that could be used as a groundcover or low border, or even in containers? Well, the wait is over!...introducing Purple Pixie Dwarf Loropetalum. Dwarf in size but huge in performance, Purple Pixie Loropetalum is perhaps my favorite introduction plant of the decade. This true dwarf, maturing at 18 to 24 inches in height with a 3 to 4 foot spread, sports deep burgundy-purple foliage throughout the year that does not fade during summer as other loropetalums do. Showy, spider-like pink flowers are produced in abundance during spring and contrast wonderfully with the foliage. In addition to it's attractive color and habit, Purple Pixie is a very versatile plant; I have it planted as a groundcover, as borders, and even in hanging baskets and containers. Purple Pixie has performed best for me in well-drained soil. I've got it planted in locations that provide full sun and morning sun with afternoon shade and it does equally well in both exposures. I've found Purple Pixie to be very drought tolerant plant once established, and it requires little if any maintenance or care. I've had Purple Pixie in my garden for about 4 years now and have yet to prune or water it. A must in every garden where it will grow! Hardy in Zones 7 to 9. 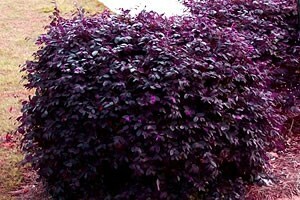 Find out more about Purple Pixie Dwarf Loropetalum and buy it here. When inquiring or purchasing plants, make sure the plants fit your USDA Plant Hardiness Zone, the location, soil type, height and maturity for the purpose you are looking for. Winter winds and sun are very hard on some plants. Some plants need a lot of shelter and others tolerate open areas. Do your research before you buy to insure your plantings will be around for many years and not just the first growing season. Awesome article! Great job! All the fall yards thank you for giving them new color and life.